Fresh from a sold-out UK tour and performing at an exclusive Chanel party during Paris Fashion Week, Django Django are about to take on America. Since releasing their first double A-side single “Storm”/“Love’s Dart” in 2009, the London-based band has continued to flip a wide variety of influences into psychedelic pop bliss with textured vocal harmonies. The results form a relentlessly creative album that’s constantly in flux but always accessible. 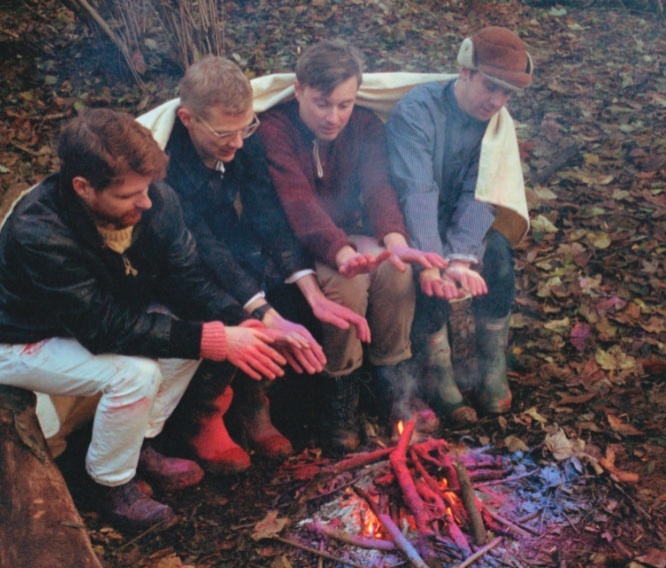 Though their self-titled debut has yet to be physically released in the US, it entered the UK charts at #25 in January, cementing Django Django’s success at home. They will be making their first trip across the Atlantic to perform in New York and at SXSW, armed with a live show that’s garnered rave reviews from the Guardian. American Songwriter gave singer/guitarist Vincent Neff a call to talk Texas, touring, and influences. Are there any plans to release your album in the US anytime soon? We’re hoping so. We’re working on deciding that. There’s talk of a single. We definitely would love to release the album, but I don’t know if that’s the first thing we’ll do, maybe a single or two before we go for that. It’s still up in the air to see what happens with that. It depends on the response we get. Your album is so diverse. Is there one particular track that you think sums up the Django Django sound at this point? I think at one point maybe “Hail Bop” was the definitive sound, with the tremolo-y guitar and catapults and synths. You can hear a sampled beat. But every time you do a track, the last track you do is kind of like, “Oh, that’s the one we were always trying to nail.” I like “Zumm Zumm” quite a lot, just because I think it’s potentially a direction we’re going to go in, a more synth-driven sound. At the moment, I think “Zumm Zumm” sums us up quite well, but Dave (drums) thinks that “Wor” is a place that we might go. Everyone’s got their own opinion on it. “Default” is the catchiest song I’ve heard so far this year, but it took me a while to realize how bleak the lyrics are in comparison to how happy the music sounds. We like putting juxtapositions like that, I think we do that quite often. We do these uptempo songs that have a major chord element to them, and then it’s kind of like dancing with tears in your eyes. That kind of idea’s always interested us, that bittersweet quality–like murder ballads you’d hear in the 1930s, these happy little ditties with very dark lyrics. It’s a mix of the two emotions that we’re quite interested in. How does a song normally come about for you? Definitely the music [comes first]. The lyrics are an important part of it, but when I’m writing a song, I often think of the lyrics as a kind of beat, like a pattern I want to make. When we begin doing lyrics to fit in with the rhythm we’ve set ourselves, it’s quite fast-paced lyrics that maybe follow a similar rhythm to a drum or a guitar. What would you consider to be your major influences? I think we’ve got a wide, varied pot between all of us. You can hear it on the album, a lot of the songs go on slightly different tangents. We like Giorgio Moroder, he’s an Italian producer, he did “I Feel Love” with Donna Summer. And then Bo Diddley, that shave-and-a-haircut rhythm he did appears from time to time. Link Wray, that caustic kind of guitar sound, and a lot of German 70s kraut music, like Cluster and that kind of locked-in beat. If we come up with a song that’s going in a certain angle, we just go with that flow and we don’t try to be bothered too much about “Oh, this is completely different from the last thing.” It’s kind of just keeping it interesting for ourselves. So everyone in the band came in with very different backgrounds? We all went to art college in Scotland. I’m Irish, and Dave and Tommy (synths) are Scottish, and Jim’s (bass) from England, but we all met in Edinburgh and Glasgow. The three of them did fine art, and I did architecture. There’s a lot of common ground, really. We’ve known each other for 14 years. But musical taste wise, I think we’re all quite similar. Some of us have different ones, but we’re all quite open, we don’t stick with one or two genres, we have jazz on one day, dub the next day, then hip-hop or old rockabilly. We just kind of pick and mix. You went from architecture to playing in a band full time? We all went full-time on the band about six months ago. It’s changed, but I’ve always been writing music since I was a teenager, and Dave’s always been writing dance music. We all went and did degrees in different things, but at the back of it, there was always a real love of music. It was kind of an accident, we started to write tunes and did a song every few weeks and didn’t think about playing live. Then, we put them up on Myspace and we got lots of offers to play gigs. So we were like, “Oh no, we need to start a band and we need Tom and Jim,” so we got them involved. That was a preconceived idea of what we were meant to be doing. Four years ago, if you had asked me, [being an architect] was the goal, to do more complex buildings and move into a variety of stuff. Tommy was a full-time artist and graphic designer, doing a lot of exhibitions, and Dave was doing something similar. We were all focused on what we were doing. But the success that we got from putting a song up on Myspace spurred us on to release a single, and the feedback from that led us to release another one. It’s all built up incrementally, to the point where it was viable. Either you do music and you give it a good chance, or you don’t. There’s a point where you just have to make that decision. But it was a good decision, and it’s really satisfying, finally getting the album out and getting the good reaction that it’s got. It’s been really heartwarming. Going back to your influences, “Firewater” has a bit of an Americana sound to it. Are you hoping to be inspired by your trip to Texas? Absolutely. It’s been a dream for a lot of us to get to America, as far as I can remember. I think there’s quite a big link between Ireland, Scotland, and American music as well. Country-western music is huge in Ireland and Scotland. There are bars where everyone dresses up as cowboys. I don’t know if it’s because the heritage of the groups is shared, but it’ll be great to experience that and see some of the things that we don’t really have over in Europe. How are your preparations for SXSW going so far? We just did the Chanel catwalk show two nights ago, for Paris fashion week. We played for Karl Lagerfeld, which was a weird preparation, but that was our last gig before we go to New York [before SXSW]. We’ve just completed a tour over here, which has gone really well. It’s just a stepping board. From my knowledge, the American dancing is a little bit not completely up to scratch, so I don’t really know where we’re going to fit in or whether we’ll fit in or how they’ll take it. We just have to come across and try it and see how it works. Are you worried that there’s going to be a cultural divide when you come to the US? I lived in New York for a while, for four or five months. I lived in Queens and worked in Manhattan, so I kind of understand reasonably well. Musically, that’s a bit of an unknown factor, but Irish people love America and Americans seem to love Irish people, so hopefully there’s a bit of love from both sides. Django Django is currently available via Amazon mp3 and for streaming on Spotify.